It had taken Bland awhile to break through to the big time. He'd been recording for Duke since 1952, when it was still located in Memphis and before Houston entrepreneur Don Robey took the imprint over. 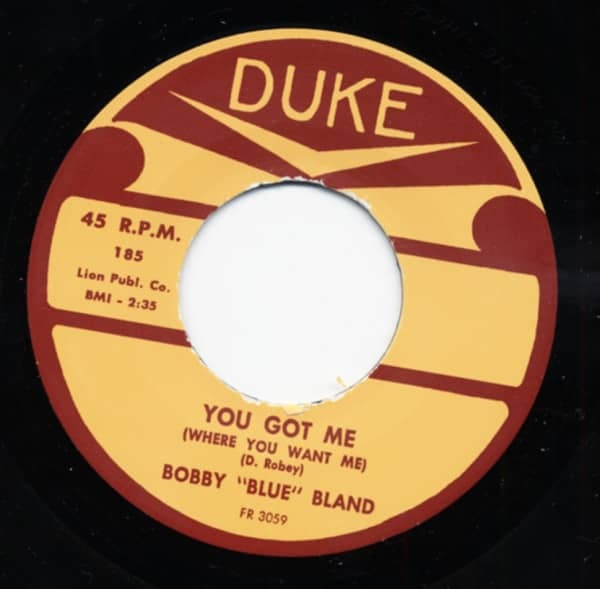 Bland's impassioned wails and Duke's scorching house band had combined to cut some spectacular swinging blues sides, but Bobby didn't crack the R&B charts until 1957 with Farther Up The Road (see Disc Five). Bland's artistic focus was steadily evolving, thanks to Duke in-house trumpeter/arranger/A&R man Joe Scott, who served as his mentor. "He was just a gift from God, Joe Scott, because he taught me and everybody that was around the Duke label," says Bobby. "Joe Scott picked some good stories for me to tell, because he saw that I was a good storyteller if I had the lyrics. Not the long, drawn-out lyrics. Just make 'em short and to the point and leave some opening for ad-libbing, whatever your idea would be. Bobby's high-flying vocal range deepened when he underwent a tonsillectomy. "I wasn't able to hit a falsetto type like I had been singing in earlier years, after the operation with the tonsils. So it kind of lowered my voice," says Bland, who adopted a favorite vocal move of a famous singing preacher as his new trademark. "I was listening to 'The Eagle Stirreth Her Nest' by the Rev. C.L. Franklin, and I heard the squall in there. So I worked on it for about four or five days and developed it. It gave me a different Bobby Bland." He utilized that squall unforgettably on his spine-chilling 1958 hit Little Boy Blue. When Bobby crooned Brook Benton's sedate ballad I'll Take Care Of You and blasted up to #2 on the R&B hit parade in early '60, it appeared he was leaving the blues behind. But Bland happily reverted to his roots on I Pity The Fool, a loping mid-tempo blues punctuated by Wayne Bennett's stinging guitar and a six-piece horn section led by Scott (Bobby's rhythm section consisted of pianist Teddy Reynolds, bassist Hamp Simmons and drummer John 'Jabo' Starks). The song was waxed on November 12, 1960 in Chicago, while Bland's contingent was on tour. Originally credited to Robey under his Deadric Malone sobriquet but probably written by Houston singer Joe Medwick Veasey, who also co-penned Farther Up The Road (Robey was in the habit of buying songs outright), I Pity The Fool catapulted to the top of the R&B charts and made a solid #46 pop showing. "Joe Medwick, he did some hell of a writing when he did all those tunes," says former Duke house guitarist Texas Johnny Brown. "Joe (Scott) found that, really," says Bobby. "It was a good change. I always had some good writers after I got my first record out there, and writers started pinpointing on what would be good for Bobby Bland: 'I'm going to write this particular tune.' It was a big thing for me." Bland was by now a leading luminary on the R&B circuit with major pop appeal and would remain so on Duke into 1972. His non-stop litany of smashes included the gospel-fueled Turn On Your Love Light (1961) and Yield Not To Temptation (1962) as well as a lights-out '62 revival of T-Bone Walker's Stormy Monday Blues and the pop-oriented double-sided 1963 smash That's The Way Love Is b/w Call On Me. Customer evaluation for "You Got Me b-w Loan A Helping Hand 7inch, 45rpm"